The folks over at Mepps keep the deals coming. If you're planning on putting down large on some Agilas, two Little Wolf lures make for a nice freebie. 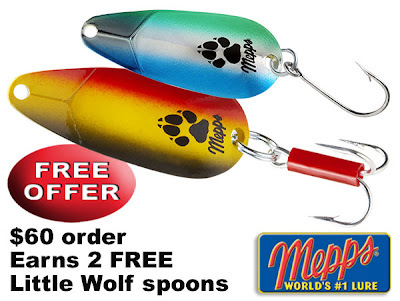 Order $60* worth of Mepps lures before July 31 and you'll get two FREE Little Wolf spoons. Featured colors include our new Black/Yellow/Red and Silver/Blue/Green. Not only are these lures FREE, but you get to choose both the size and hook style. Our Color Technology studies have shown us these two new colors are very effective under a wide variety of fishing conditions. Get started on your order here.